Senegal is a nation in West Africa that was fought over by many of the European Powers, finally ending up under French control. A territory that proved important as part of the slave trade, with France being able to trade with the many warring tribes for bodies to take to the America's. 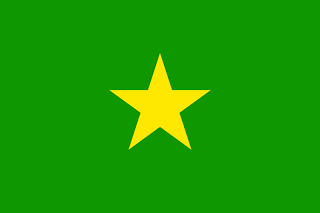 With the independence movement growing, Senegal sought greater self-determination, and opted, in 1958, for a green banner with a gold star in the centre. 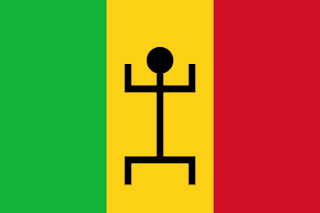 However, April 4, 1959, Senegal merged with Mali to form the Mali Federation. The new flag took a vertical tricolour of red, yellow, and green, with a black stick figure in the central yellow stripe. France granted it independence, but the federation was short-lived, with Senegal not wanting to go along with all the political decisions made in Mali, and the Federation collapsed in 1960. Upon the Federations collapse, Senegal opted for a new flag. 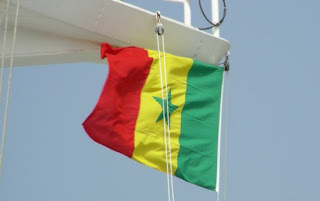 Taking the tricolour of the Mali Federation, Senegal simply replaced the black stick figure with a green star. Senegal did go for another political union, when in 1980, they tried to create the Senegambia Confederation. A union of Senegal, and the thin nation of the Gambia, which Senegal completely surrounds. However, there was no flag for this, and it collapsed as well, when the Gambia did not want to head for more unity between the two states.